Any explanation of pink preference that is handed to children by the society they live in and only looks at the last hundred years, and calls itself “evolutionary psychology”, is blatantly misunderstanding both words in its title. Well, yeah, as someone with training in evolutionary biology and some interest in psych, this has been the problem all along, really. “Social Darwinism” wasn’t really, either. 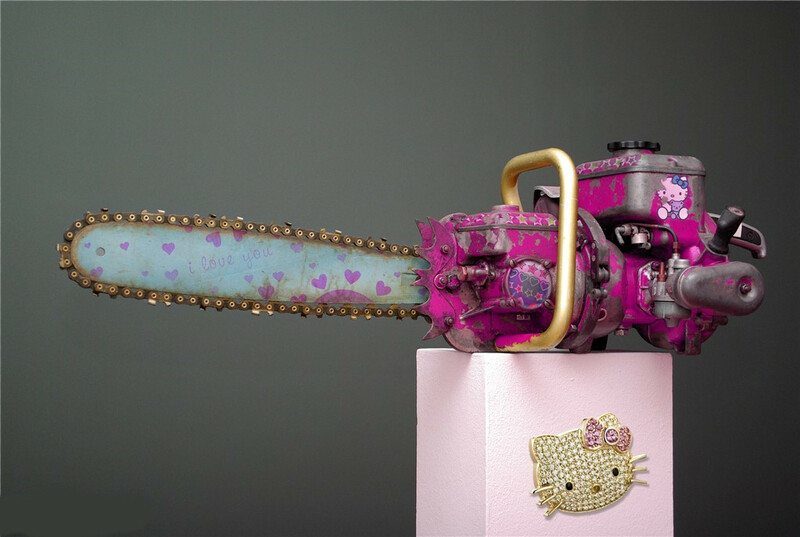 For some reason this amuses me inordinately: a Hello Kitty pink chainsaw. Because nothing else says ‘I love you’ better than hacking it to pieces with a pinkified power tool. Damn! The “Hello, Kitty” chainsaw picture is blocked-for-my-protection by the censorware, but it sounds awesome! I want one even more than I wanted the “Hello Kitty” Telecaster I dithered about buying for too long. Have tumblr’d the chainsaw pic to hopefully get it past your image-blocker, DI (nr). Thanks TT, have yet to uncover the wonders of tumblr. I think this one is more a DIY job DINR, so you should be able to get your own any time the muse takes you! Want. But I could probably do it myself to either of the chainsaws I already own. Stencils and pink paint, right? Oh, the original link was fine from home, btw, but for reasons that elude me my employer felt a need to protect me from pictures of “Hello, Kitty” chainsaws. Can you blog your progress DINR? Please? OK, Mindy, soemthing will appear on my Doomstead blog at some stage. Excellent! Thanks DINR. Can you drop a link to your blog? Yay! My brother will love this project. Ah yes the old link in the user name! Doh. Thanks DINR.